Our HousePEX PEX Manifolds are for PEX (PEX-A, PEX-C or PEX-B) and are used for radiant floor heating. The HousePEX 2 Port for 5/8 Inch PEX Tubing comes with built in temperature gauges, PEX adapters, supply and return ball valves. The air eliminator, ball valves & temperature gauges save you $130.00 as compared to base pex manifolds. 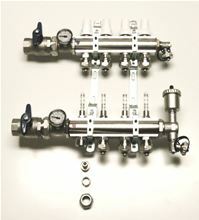 Please note, these manifolds are only used for hydronic heating systems and only for PEX-A, PEX-C or PEX-B PEX Tubing.